The backdrop altered from a clear blue to a vivid gold; from a vivid gold to a neon orange, and lastly, from a neon orange to psychedelic hues of lilacs and violets. Audiences flocked around together. Some chirped while some screamed. Some wandered leisurely while some just strolled in glee. And I? Just laid there on a rock bench beneath the ever-changing color scheme. I was in a theatre which is just one of a kind. The kind which is skirted by sand dunes on all of its sides. The kind which is perched on the Eastern edge of the Thar Desert. The kind that has peacocks, chinkaras (Indian Gazelles) and Blue Bulls as their casual spectators. The kind where only the five of us were human spectators. The kind where Sunsets lay the commencement of a wonderful starlit sky. The kind that is untouched by human intervention. The kind that is still precious. To You and I.
I was in the middle of a living desert, where no houses appeared at a stone throw’s distance and the only people I had around me was Ghemar Singh ji and his family. The Sun had left behind a pastel-colored canvass, beneath which we sat on an intricately carved stone bench with cups of chai; overlooking millet farms, diving deep into conversations, discovering a mutual liking to be in close connect with nature and living in a land untouched by multitudes of human civilization. “I’ve always had an out-of-the-way desire to embrace the nature’s bounty wholeheartedly and have an uncanny urge to meet new people and have cross-cultural connections which untimely carved way to the initiation of a noble idea ~ HACRA.” Ghemar Singh ji expressed in deep gratitude. As the violet sky deepened to a pale black color dressed with grey clouds and a shying moon, I accompanied Ghemar Singh ji’s family for dinner over tales of rural folklore and legends. It was then, I could finally have a prim conversation with Ghemar Singh ji’s wife whom he always referred to as ‘an artist’. Upon crystal clear exchange of thoughts, I could easily relate her to being ‘an artist’. Coming from a far-fetched village near Jaisalmer, she’s always been Ghemar Singh ji’s constant in supporting his idea of HACRA Dhani. She’s the one who runs the HACRA Community kitchen, hence, the one behind every tasty food you’ll have at HACRA. After an hour of intimate conversations, I walk past the moonlit sparse desert down to my mud hut and cozily puff myself in the comforts of a thatched roof and walls plastered with cow dung. I lay there being fast asleep, while a cold nip in the air blows by; caressing the restless sand grains and waking me up to the break of the day in a barren land that spoke to the delicate call of the Indian Gazelles and took heed of the chirpy birds. As the morningtide unfolded, a layer of gold draped the orchre sand. Thirty minutes past six and we could be dotted; juggling our way through thorny bushes heading somewhere to the other side of the HACRA site. We walked past mini dunes, slid through the huge ones, spotted herds of Indian Gazelles, and a blue bull. Took in the freshness of discovering new horizons, had a close rendezvous with plants under the guidance of Ghemar Singh ji and worshipped the local shrine in the company of peacocks and hoopoes. We plucked bitter-sweet fruits from the trees and headed back to the HACRA site only to be welcomed by a plate full of bajre-ki-roti baked on the chulha and a bowl of sweet porridge ladened with pomegranates and sliced bananas. After a tummy full of food, and a heart full of longing memories, I had to head back bidding goodbyes to the HACRA family and to the bit of me which was kept veiled under the grainy sand dunes of the Thar! 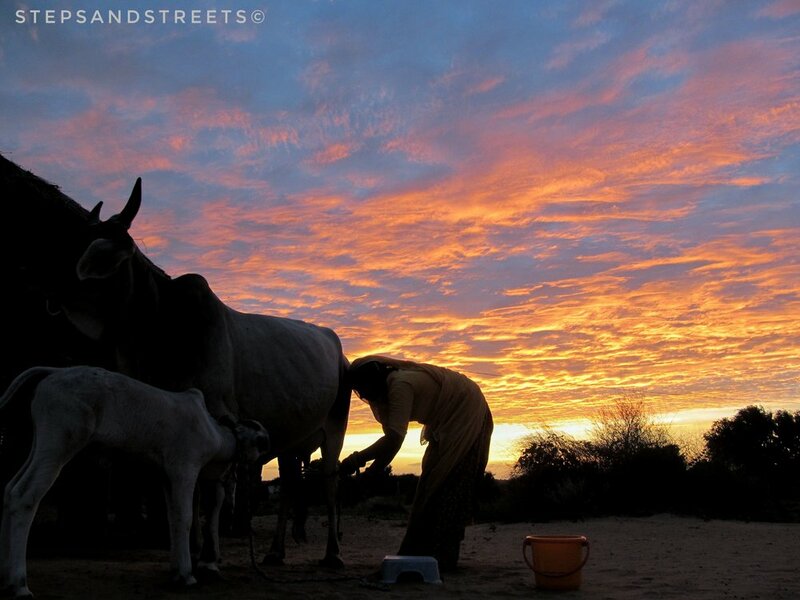 HACRA Dhani is a community-run rural and eco-tourism homestay in the middle of the Thar Desert. Life at HACRA is a complete replication of life in general in the sparse and arid regions of Rajasthan. It is where accommodation is offered in rustic mud huts with solar lit lamps during night time and a non-attached bathroom 3-4 metres away. Water being sparse in this region, HACRA doesn’t offer running water; however, it does have a water tank right adjacent to the bathroom that ensures 24 hour water availability. *Presently, HACRA Dhani is looking for volunteers (travel bloggers, digital marketing experts, content writers, and English language teachers) for a span of 2-5 weeks to help promote their business. Volunteers in turn would be offered accommodation and food for free. However, any other expenses needs to be borne by the volunteer. 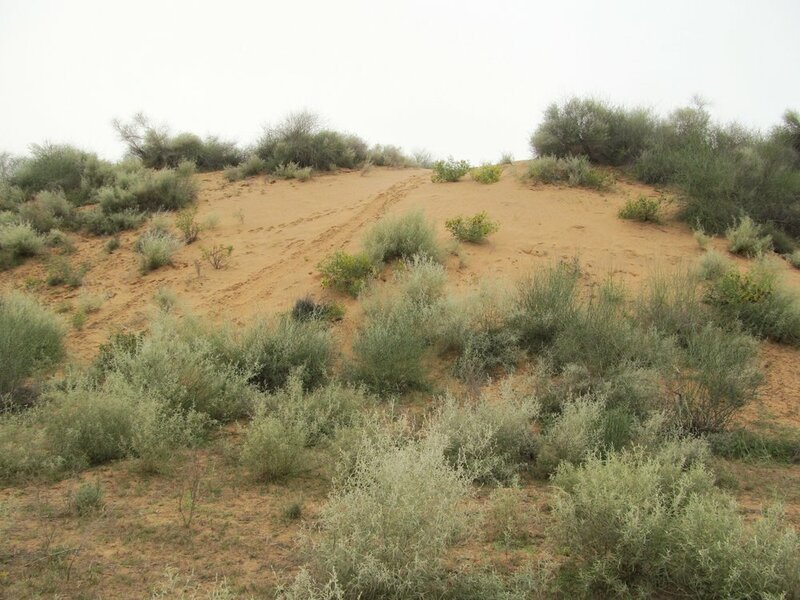 Over to you, have you ever taken the offbeat route to the Thar Desert?